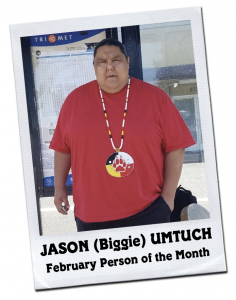 Jason (Biggie) Umtuch, Warm Springs/Wasco/Yakama/Blackfeet, is the February Person of the Month Award recipient. He is being recognized for his kindness, dedication to service, ability to stay balanced and trust in the Creator. Jason believes that everyone has a unique reason, a purpose and a gift in life and that everyone is more connected than we are unconnected. For Jason, “No” is rarely an option when helping others. Those around him notices a big change in his life when he got involved with the Portland Wellbriety Movement group, known as Lifted Spirit. Since joining, Jason has devoted himself to, not only those he loves but to, our community as a whole. Jason never expects anything in return for all that he has done for his community, which makes this recognition and award even more remarkable. Some significant words used to describe him by his peers are: resilient, trustworthy, listener, warrior and leader. For the past 8 years, Walpole Island First Nation has actively been engaging, supporting, and implementing Wellbriety programs in the community. They have created Wellbriety groups, and made major efforts to make several programs available to First Nations community members and families. Their efforts have created space for positive community change! The NNADAP workers have been getting trained in Wellbriety programs, and return to their communities with resources to provide structured programming in the areas of prevention, recovery, and community healing. Programs can be offered as continued aftercare support for those individuals returning from residential treatment facilities as well. 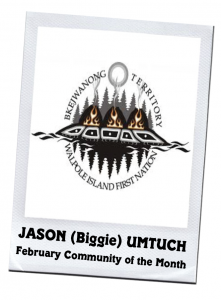 This is why we are recognizing Walpole Island First Nation as the February Community of the Month Award Recipient! Congratulations and thank you all so much for your continued support!